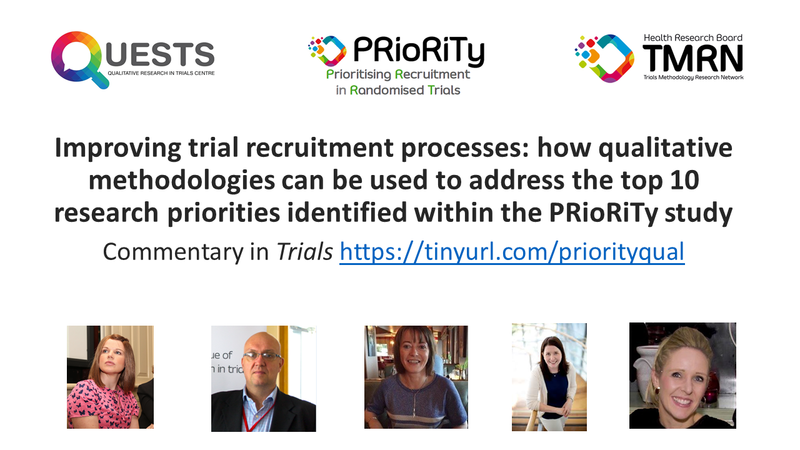 The PRioRiTy (Prioritising Recruitment in Randomised Trials) study aimed to identify and prioritise important unanswered trial recruitment questions for research; the recently published paper by Healy et al. outlines the top 10 prioritised questions for trial recruitment research identified. Researchers at QUESTS, along with members of the PRioRiTy team, have just published a commentary on Improving trial recruitment processes: how qualitative methodologies can be used to address the top 10 research priorities identified within the PRioRiTy study in Trials. In this commentary, they illustrate how qualitative research can address questions in trial recruitment that are not easily addressed by quantitative methods, by providing in-depth information on the experiences of participants and recruiters. They illustrate how qualitative research can be utilised to generate in-depth insight into trial recruitment issues, either as a stand-alone methodology, or through a mixed-methods approach. Consideration is given to how different forms of qualitative research can be used to address these priorities and to help researchers set out an agenda to optimise its value. Methods discussed include (1) interviews and focus groups; (2) observation, audio recording and documentary analysis; and (3) qualitative evidence synthesis. Congratulations to QUESTS Communications Officer Marita Hennessy, QUESTS co-chairs Dr Catherine Houghton and Dr Andrew Hunter, and Dr Patricia Healy and Dr Sandra Galvin from the PRioRiTy study team on this publication.